These are the popsicles I imagined when I bought popsicle molds. Popsicles so simple and inexpensive to make, yet bursting with flavors both sweet and tart. Popsicles that come together easily, from ingredients I usually have on hand, yet taste like some kind of frozen confectionary masterpiece. 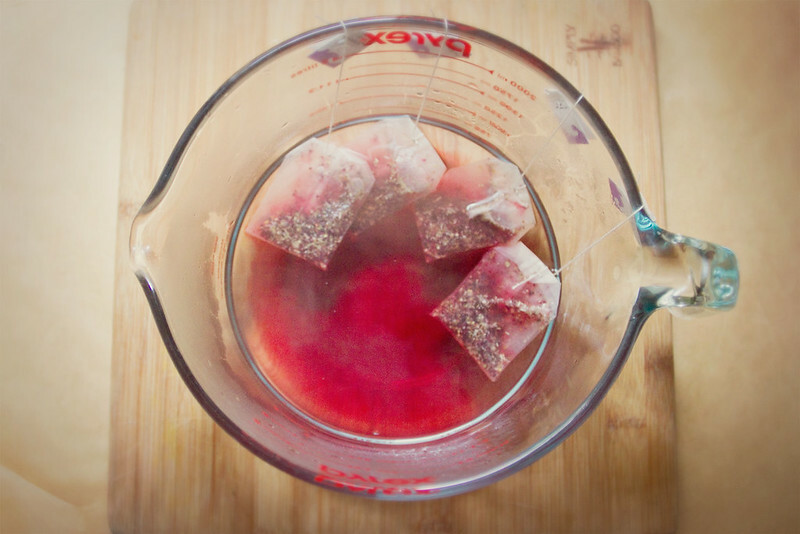 Herbal tea is one of my favorite drinks of all time, and hibiscus is one of my favorite types of herbal tea. 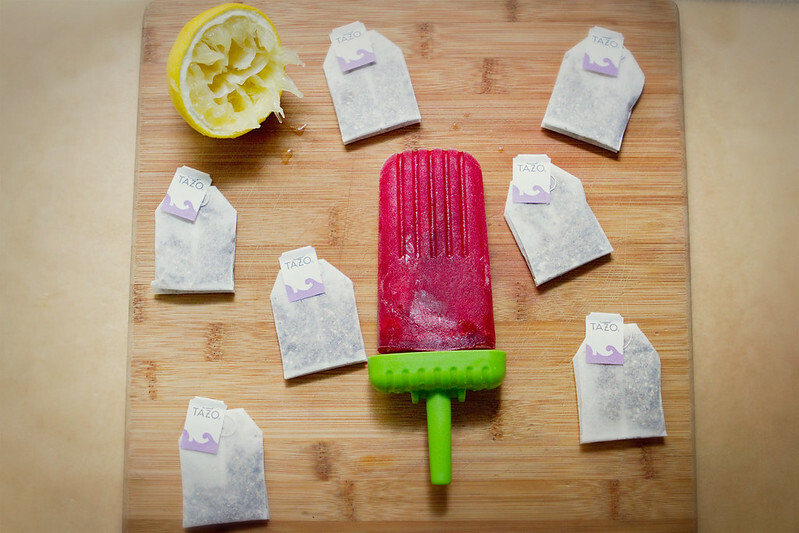 I like hibiscus as hot tea, or iced tea, in sorrel, with seltzer from my soda stream, and now, as an Arnold Palmer style popsicle with lemonade. When I first decided I would make these I wasn't 100% sure about how to go about it. Could I get the two liquids to stack, like some restaurants do? Should I make the tea and lemonade totally separately, like when one makes an Arnold Palmer drink? If I did that, I would either need to make a simple syrup for the lemonade aspect. While simple syrup isn't hard, I wanted this recipe to be very simple. Then I realized I could just add all the sugar for the lemonade and the tea to the tea while it was hot, then add some cold water and lemon, and voila, Arnold Palmer. I then decided to add some raspberries because yum, raspberries. If you have a different berry- strawberry, blueberry, blackberry, any of these would work nicely in this pop. The berries aren't even necessary- the tea/lemonade pop would be great on its own. 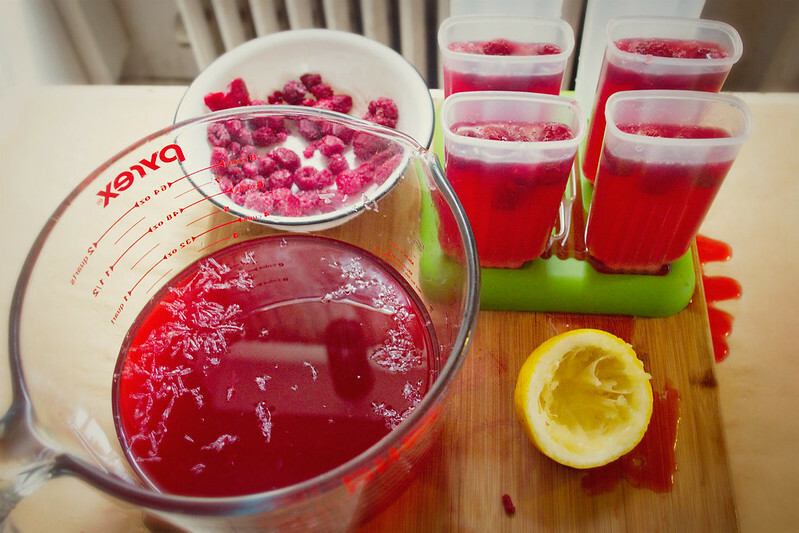 Boil 2 Cups water, and add a few cubes of ice to the other 2 Cups water, to keep it nice and cold. When the water boils add the tea bags, let steep until the tea is a very rich red- about 4 minutes. Remove tea bags and add honey and sugar, mix until both dissolve fully. 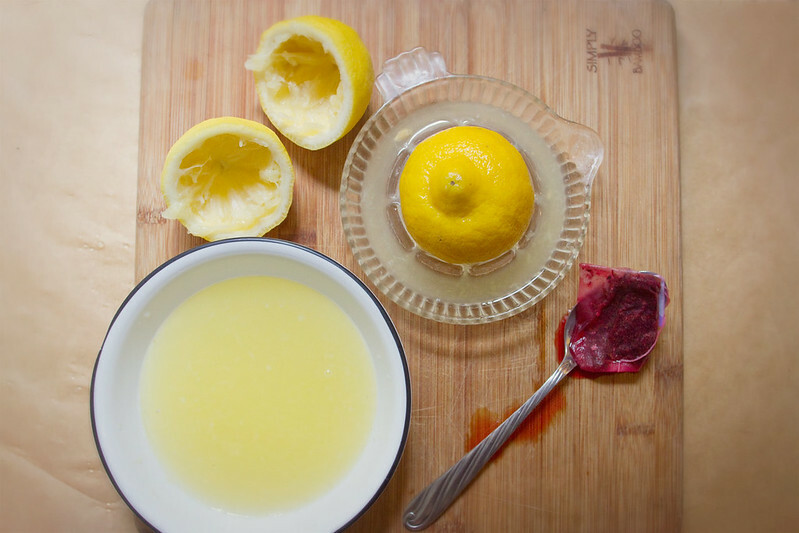 Add lemon juice and the ice water, mix well. Allow to cool for a bit if you use plastic molds, to prevent any melting or leeching of plastic chemicals. 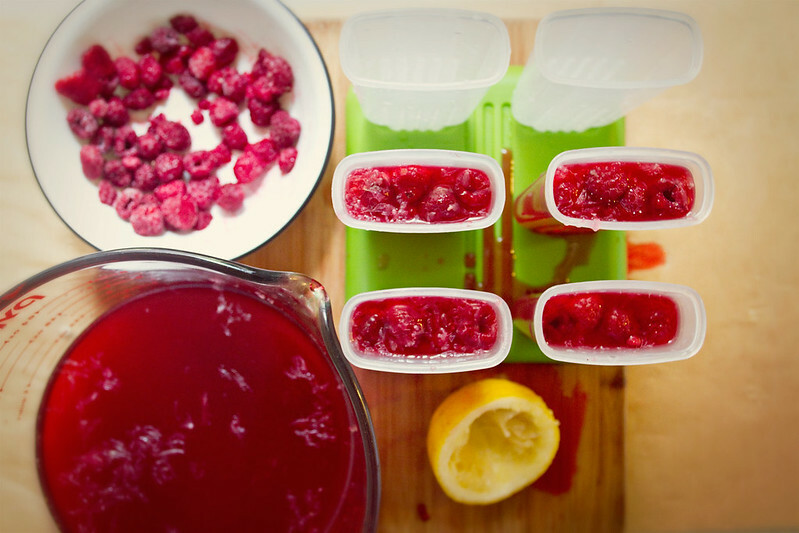 Add a small handful of raspberries to each mold, about 7 berries, and fill with the tea/lemonade. The berries will float at the top. If you wish to disperse them better you can push some down with your popsicle sticks when you insert them. Add your sticks/covers to your molds, and freeze about 7-8 hours. I run my molds under warm water for about 10-15 seconds before removing the pop when serving. 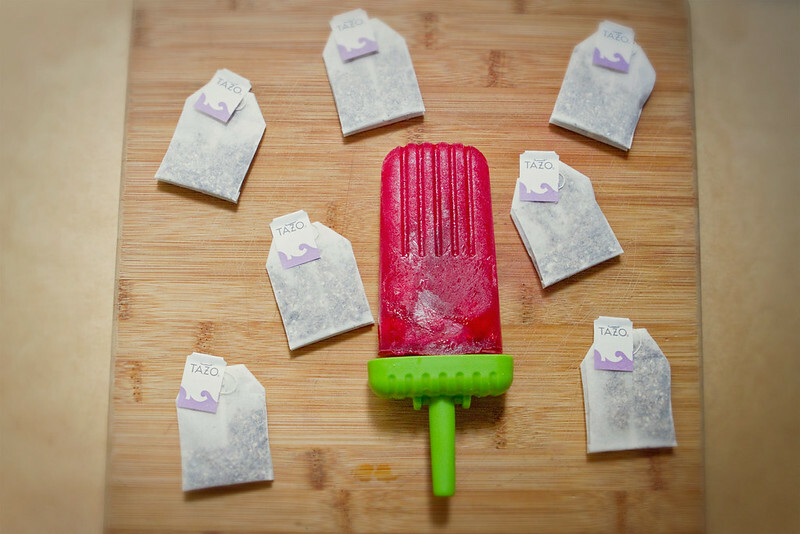 Substitutions: Black tea, the traditional Arnold Palmer tea, would be lovely in these pops, as would green, chamomile, or a myriad of fruity herbal teas. The 3 Tbsp sugar could be replaced with 3 tbsp honey, or 2 tbsp of agave syrup.